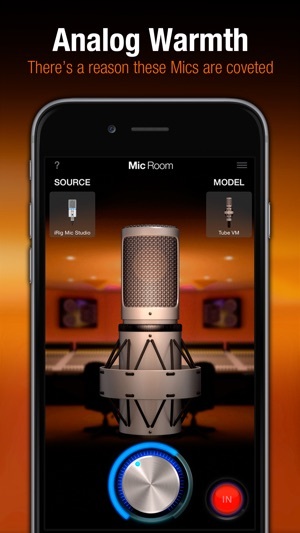 Mic Room is an extremely powerful and easy-to-use microphone modeling app for your iPhone or iPad. 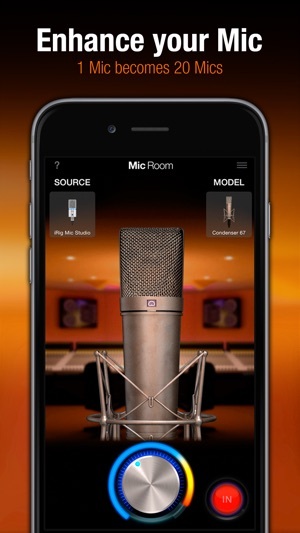 It gives you a comprehensive virtual collection of some of the most iconic microphone models of all time. Now you can have a diverse and versatile range of mic sounds that you can bring with you for use anytime and anywhere. Mic Room gives you 8 microphones to start with, expandable up to 20 in total that cover the entire spectrum of sounds from classic to contemporary: You get a spread of dynamic, condenser and ribbon microphones that have all been modeled on the essential tools used by A-list production studios everyday. 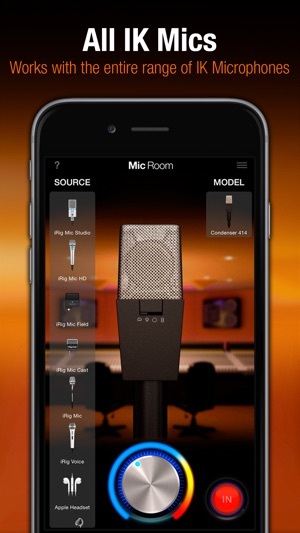 And you can add on to this initial collection with even more microphones via in-app purchase. Using Mic Room couldn't be easier. 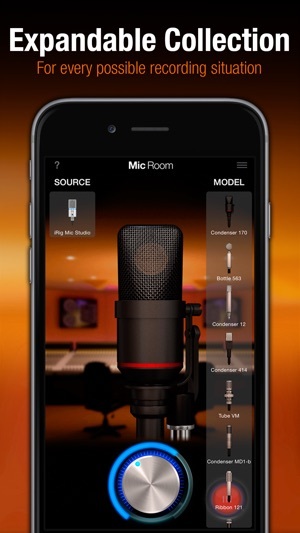 It works seamlessly with your favorite high-quality hardware microphones (like IK's iRig Mic Studio or iRig Mic HD 2) or the built-in mic on your iPhone or iPad. 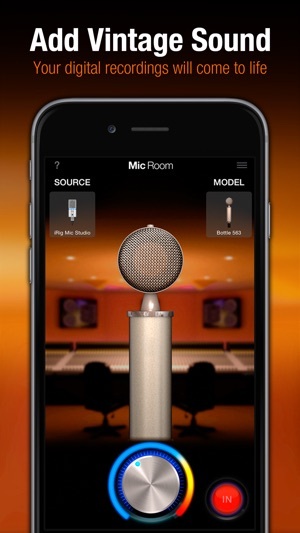 Just plug in, open the app, select which model you want your mic to sound like and there you have it — you're ready to go. And, to make sure you always get the best sound possible, each virtual microphone includes an input gain knob and an easy-to-read circular level meter. Just touch and drag until you get the sound you want. You'll be amazed by the sound quality of these microphones. It's just like having the real thing in front of you. This should come as no surprise as each has been crafted by the same team of engineers behind IK's acclaimed AmpliTube and VocaLive families of apps and software. - Added support for iRig Mic HD 2 and ARC 2.5 MEMs microphone as input sources. - General reliability & security improvements. 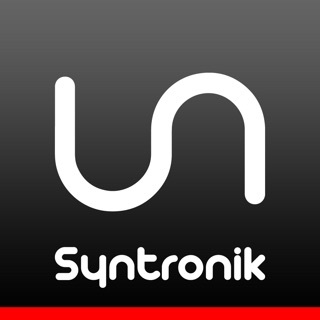 Ik Multimedia has always been ahead of the curve when it comes to iOS audio production and performing app, I own almost all of them, but as of late I feel like they are falling behind the curve somewhat by not implementing auv3 into their apps. It's what we need now, iaa and Audiobus was and still are great features, but we need au now if now more than the other forms of connecting apps. This app would shine if I could use it on more than one vocal track at a time. Thanks for your review and feedback. I am happy to pass along your interest in seeing AU compatibility on iOS! I tried this app hoping for I don't know what, but micswap pro is so much better. Micswap records, imports audio and changes the sound after the fact, plus you can swap studio environments. Still love IK multimedia though!